Buyers of Will Bontrager's "52…" book can obtain a special login for easier copying of code, for downloading the bonus book, and for viewing the 100+ additional short Techbit videos in the special buyer's area. Tap a link to buy. Have you always wanted to learn how to do cool things with your own website? To learn many of the little things you need to know when maintaining your domain? This book is for you. It contains 52 technical tips and information, bite-sized for easy comprehension — written by someone with nearly 2 decades of experience writing software for websites. Free updates for new versions of the book and additional code, always. Be the person who seems to always have instant answers when others have tech questions. Learn one technique every week for a year. Or one a day for 7½ weeks. Automatic scrolling to the bottom of a div. Working with the Ajax same-origin policy — must-know if you'll be using Ajax. How to prevent form submission — for demos, illustrations, and other reasons you may have. A Techbit is a short write-up of a skill or technique you are likely to need for your website — information, how-to, or preventive measure related to website operation, web page design, content formatting, or web page features such as forms and responsiveness. Three ways to set a cookie — when one method isn't feasible, another is likely to be. A link to launch an email app — so they don't have to use a form to write to you or to recommend your website. Because copying code from books can be difficult, web pages with easy-to-copy code have been created for buyers of 52 Good-to-Know Techbits. Also web pages with demonstrations mentioned in the book. The Appendix has more information. -1- Presenting Your Content — Techbits offering various approaches to presenting, formatting, making responsive, shaping, and getting attention — related to content on a web page. There may be some techniques here you have no idea could be done. -2- Production Tools and Timesavers — Techbits with methods and tools to save time and frustration. Plus information website developers really must have at hand. -3- Website Management — Techbits with information and code addressing cookies, www and non-www domain URLs, secure sites, a content theft prevention method, and other techniques it's good for website owners to be aware of. -4- Create, Enhance, and Manage Forms — Techbits describing different actions that can be done with forms. These are techniques to make your forms more efficient, more effective, more responsive, or more profitable. 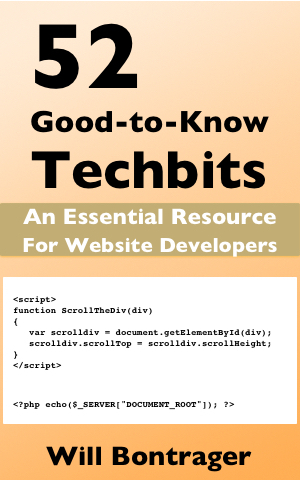 If you develop or maintain websites, 52 Good-to-Know Techbits is an absolute must. Tap a link to buy. I'm virtually certain you'll be glad you did. Because copying source code is difficult (as you no doubt already know), we're providing separate web pages where the source code can be copied with ease and certainty. Larry Steiner, a website designer and hoster, had this to say an hour or two after he bought 52 Good-to-Know Techbits. I bought it as much to support you as to get the responsive site tips. But, after skimming through it, I found it to be worth so much more than the price, as usual. See SouthwestGeorgia.com for an example of Larry's work. When you buy 52 Good-to-Know Techbits, we want to give you a special premium, a free book, Responsive Coding Tips & Tricks. The purchase receipt the retailer sends to you when you purchase 52 Good-to-Know Techbits is your proof-of-purchase. The retailer can be Amazon, Barnes & Noble, Kobo, or Google Play. 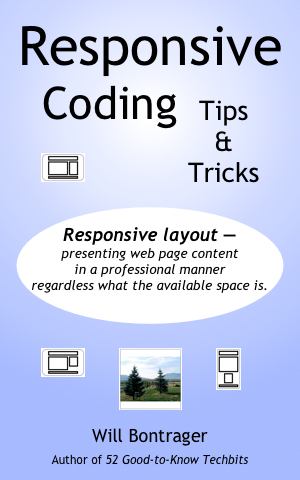 Responsive Coding Tips & Tricks is new, available nowhere else. It provides the basics for coding responsive web pages. There's a private login to demonstration pages so you can see how the variously-coded responsive pages work. A .mobi file for Kindle. An ePub file for iBooks, Kobo, Barnes & Noble, and GooglePlay. A PDF for most computers and mobile devices. And Responsive Coding Tips & Tricks also can be read online. Buy 52 Good-to-Know Techbits now. The book will tell you how to get Responsive Coding Tips & Tricks for free, with our compliments. You also get free access to the Buyers area where you'll find copy and paste source code and demonstration pages.